It has become easier and cheaper to eat unhealthily. Go to any store and you can buy six donuts for a fraction of the cost of six apples. Obesity is a burden on the health system and it is a burden on the individual, because the quality of life is not what it should be. Exercise will help to lose weight but your diet is even more important. We have compiled a list of 10 best natural fat burners (and even thrown in a few recipes too) that will help with your weight-loss efforts. Juicing is about to become part of your life. What is a good juice filled with? Vitamins, minerals, chlorophyll, antioxidants, and phytonutrients, right? Well, fruit and vegetables too, but when you get down to it, they are the carriers for the real good stuff. We love the ease and convenience of making our own juices and smoothies. Prepare fruits and veg the night before. Stick them in the fridge or freezer and blend them up in the morning with water or milk. Juicing really is a great way to add vegetables to your diet. Lots of us have trouble adding enough leafy, green veg to our diets, and we can tell that you are turning your nose up at a fresh glass of liquidized green stuff. Throw in a few berries, slices of apple, or a kiwi, and the bitterness is replaced with sweetness. You can throw in all kinds of healthy foods and mask the flavor with sweet fruits. We all know that fruits and veggies are an important part of our diet, but what can a fruit and veggie smoothie do for you? Juice is easily absorbed and packed with fiber, vitamins, and minerals. Green juice leaves you feeling full and satisfied. It gives your body all the nutrients it needs. There are no empty calories. Junk food has you craving more. Green juice gives you satisfaction. Green juice satisfies your sweet craving while giving you a dose of healthy food. You are getting the nutrients you need, satisfying sweet cravings, feel full, and feel satisfied. This is a recipe for weight loss. A great combination of fiber and antioxidants to leave you feeling good, satisfied and happy. Great for breakfast fat-burning. Take 1 ripe kiwi, 5 spinach leaves, 3 lettuce leaves, and a cup of water. Peel the kiwi and throw it in your blender with the other ingredients. Blend the ingredients together until the leaves have broken down. Pour into a glass and serve. This is a great juice to drink first thing in the morning. It is also a great smoothie for satisfying hunger pangs. This juice is great for cleansing. It is also a great anti-inflammatory. This juice will help you to lose weight and will help with any existing health conditions. This booster is amazing for jump-starting your metabolism and improving your immune system. Take the juice of 1 lemon, 5 parsley sprigs, 6 spinach leaves, a celery stalk, half a cucumber, 1 tsp of grated ginger, and a cup of water. It is best to squeeze the lemon juice fresh. Add it to your blender along with all the other ingredients. Blend the ingredients until smooth and serve in a glass. This is best consumed first thing in the morning, and we would recommend drinking this green juice three times a week. This drink is super low in calories but still packs a punch. There is a multitude of vitamins, minerals, and antioxidants in this drink. This drink also helps to decrease fat absorption and boosts your metabolism. Both help with weight loss. Take half a cucumber, 3 celery stalks, a green apple, and a cup of water. Core the apple and compost the core. Chop all of the ingredients and add them to the blender (you do not need to chop the water). Blend until smooth and serve in a glass. This is a great drink in the afternoon. Combine it with a small snack instead of having a large lunch. Consume 2-3 times a week. 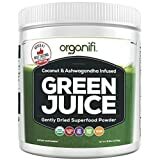 If you don't have a juicer or cannot find all of the ingredients, then you can try Organifi Green Juice Powder. It has all the health and weight-loss promoting super foods in one drink. It is a convenient way to add green juice to your diet without the shopping, preparation, and cleanup. Try it out for 30 days and if it doesn't work for you, simply ask for a full refund. Please check product link for full details. You only need to hear the words ‘green tea’, and immediately you imagine health benefits. This amazing drink is packed full of antioxidants, and it is a great fat-burner too. Green tea boosts your metabolism, reduces fat absorption, and even eliminates fat absorption. It is almost 50% better at burning fat than other drinks . A good-quality cup of green tea affects you on a biological level. It contains many beneficial substances, but the most surprising may be caffeine. Caffeine is a stimulant and can help with fat-burning and physical performance. Green tea does not contain as much caffeine as other drinks, but when combined with its other health properties, it is the go-to drink for fat-burning. Coffee contains caffeine (unless it is decaf), which can help you to burn fat. Studies have shown that coffee can help to curb cravings and hunger pangs. Some researchers have attributed this to caffeine, but decaffeinated coffee has been shown to have the same effect. If you are okay with the caffeine, you can go with the regular. If you do not want the caffeine, you can go with decaf coffee or switch to green tea. Coffee has also been shown to increase the rate at which you burn calories . Coffee can do great things for you, but you should also be aware of how caffeine affects you. It can increase your blood pressure and lead to anxiety. Chili peppers are flavorsome and hot. So hot, that a lot of people do not like the taste at all. Chili peppers and jalapeños contain capsaicin. This compound sends a message to the brain that the mouth is being burned. The brain responds very well and very quickly to this. Why would we recommend this? Well, it has been shown that capsaicin can greatly boost metabolism and help burn fat quicker . Eggs are very beneficial (when eaten in moderation). They are a great source of protein, and they are packed full of fat-fighting nutrients . They are full of vitamins (9 of them), minerals (8 of them), amino acids and many macronutrients. Some of the most important fat-burning ingredients are iron, calcium, vitamin B12, and thiamine. Have one or two eggs every couple of days, and you will not be affected by the saturated fat. You will only benefit from the good stuff. Dairy is our main source of calcium and calcium can do more than help us grown strong bones. Calcium can inhibit the production of cortisol. This hormone helps fat to accumulate in your abdomen. Even low-fat milk has the ability to limit fat accumulation. Combined with the low amounts of fat already contained in the drinks, low-fat milk can be a great addition to your diet . Do not limit yourself to milk only. There are a great variety of dairy products which can be added to your diet in a variety of ways. Go to your local grocery store and pick up some Greek yoghurt, cottage cheese, fortified yoghurt, fortified milk, and cheese. Red meat can bring its own health problems, but lean red meat can be an amazing source of protein and other nutrients without bringing you the artery-clogging fat associated with it. Recent studies have shown that diets which are high in protein and low in carbs are effective in weight loss. More and more scientists are recommending lean red meat as a fat-burning food . If you are choosing your meat, you should always go lean. Choose lean or extra lean beef instead of regular. To know if your beef is lean enough, you should check the nutritional information. Lean meat is meat which has 4 grams, or less, fat per 100 grams. You should also take into account your cooking method. Lean meat is fine, but if you are frying it in a lot of oil, you are adding the fat back in. It is always better to grill or roast your meat. Barbecuing gives meat a great flavor. Try to cook the meat on a rack which will allow the fat to drain. If you do have to use fat, use a small amount of olive oil. Vitamin C is one of our most essential vitamins. Vitamin C boosts your metabolism and helps to burn fat quicker. Vitamin C also offers a range of other health benefits. It can fight colds, lower cholesterol, and more . When we think of vitamin C, we think of oranges, but there is a range of foods you can add to your diet. Try lemons, limes, blood oranges, and grapefruits. Lecithin is affectionately known as ‘natures emulsifier’. It has fat-burning and emulsifying properties which make it a grants addition to your diet. Over recent years it has become more popular as a natural supplement and weight-loss aid. It is also great for your liver. Some researchers have even gone as far as to state that lecithin has the superpower to dissolve stored fat as well as limiting the absorption . Find it in tofu and soybeans. Water is life. Without it, we would not be here. Water can boost your metabolism. It helps to cleanse your body of waste. Drinking water keeps your appetite at bay. Drinking water also helps fight water retention; meaning you will lose weight which has built up as water in your body. Drinking water before and with a meal can actively reduce the number of calories you consume. One study suggests that having just one cup of water before a meal would cause you to consume 27,000 less calories per year . It is a no-brainer - make water a regular part of your day. Effective fat loss workouts include a lot of cardio and HIIT exercises. Below you'll find our personal favorites from the FitnessBlender duo. Kelli and Daniel are a down to earth couple who provide, in our opinion, the best workouts on the entire World Wide Web. All the listed workouts include both a warm-up and a cool-down and are well balanced. Combine these workouts with the fat burning foods in this article and you'll achieve your weight-loss goals faster than ever.